Plaid skirts have never really been my jam. I’m all for the Punk-come-St. Trininan's look but I’ve never really committed to it as a print. I guess it just reminds me too much of my old school uniform, and those days definitely aren’t ones I relish in remembering. School sucked. I saw this blue on on ASOS and thought I'd give it a go. As it's pretty obvious at the moment I really like print clashing and I think these two work together really well for some reason... I don't know why... they just do. Such a cute Look! Love the polka dots and plaid! Plaid has made its way into my heart. I just love it! Love the polka dot jumper! I really love the blue in that skirt! its hard to see that colour in plaid skirts in the shops at the moment! love it! Lily your style is always perfect!! It is always a pleasure seeing your outfits!! This is so cute! 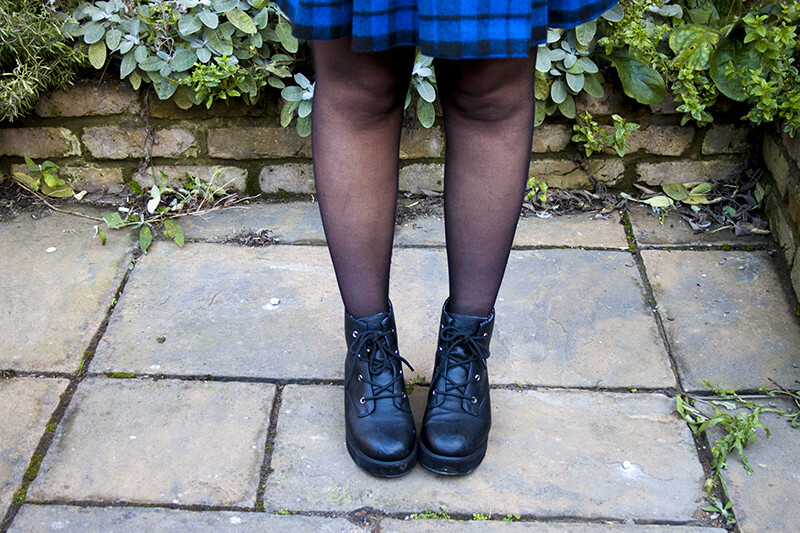 Loving tartan so much this season! love this look, you look fab! So stylish and on trend! Loving the clashing prints, the skirt is fab. Love love love your jumper!